We've had personal chef clients get a little nervous when they saw how much salt we were sprinkling on their steaks before grilling them. That's too much salt, they'd say. Our response: Trust us. Invariably they'd report afterward that it was the best steak they'd ever had. We say this not to brag but merely to illustrate our point. If you think about steak, it's pretty thick. An inch and a half thick, if you've followed our guidelines for selecting the best steak. And you're only seasoning the surface, which means a significant portion of the meat has no salt on it at all. That's why we need to salt generously. If you were only eating the surface of the steak, it might be too salty. But you aren't. You're eating the whole steak. So the seasoning on the surface has to be enough to properly season each bite. Make sense? When to Salt the Steak? There's another question that crops up as it relates to seasoning a steak, and that has to do with when you apply the salt. Some chefs like to salt a steak well in advance of cooking, like up to 24 hours in advance. Others say salting it right before cooking is best. The main drawback to seasoning in advance is that salt applied to the outside of something tends to pull water from the center of it onto the surface. If the thing in question happens to be a steak, it will necessarily be less juicy. Indeed, any steak you hold in the fridge, salt or no salt, is going to lose juices overnight. Another drawback is that it extends your prep time. Seasoning your steaks 24 hours in advance of cooking it means you're in the kitchen 24 hours before dinner working with the steaks. You also need to make room in your fridge for these steaks for an additional 24 hours. If you're all right with all that and want to give this method a try, here's how: Pat the meat dry with paper towels and sprinkle both sides of the steaks generously with Kosher salt. Be sure to get the salt on the edges of the steaks as well. That's 1½ inches of surface you definitely want to cover. Press the salt crystals into the meat with your hands. Transfer the steaks to cooling racks with a sheet pan or cookie sheet underneath, cover the whole tray with plastic wrap and stick them in the fridge. Take them out about 30 minutes before cooking, pat them dry again with paper towels (because the salt will pull out some juices), season with freshly ground black pepper (press the pepper into the meat as you did with the salt) and then grill as you normally would. We'll talk more about black pepper in a moment. As for patting the steaks dry, a dry steak will form a browner crust when it's cooked. 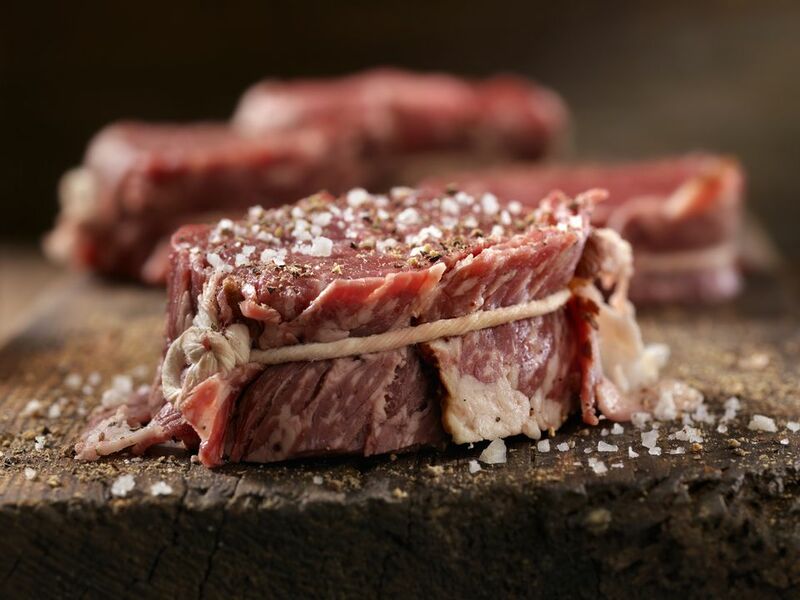 If you're salting right before cooking: Again, let the steaks sit at room temperature for 30 minutes, sprinkle both sides (and the edges) generously with Kosher salt and freshly ground black pepper. Press the salt crystals and pepper granules into the meat. We like to brush our steaks with a little bit of clarified butter right before we grill them. You could use a refined high-heat oil or a mixture of oil and clarified butter. Anyway, the debate over when to salt is just that—a debate. The best chefs in the world don't agree on which method is best. Both will work fine. One is easier (and maybe even juicier). You do the math. One school of thought suggests that applying the pepper before cooking can cause the pepper to burn while you cook it, imparting a bitter flavor. Followers of this school suggest grinding pepper onto the steaks after searing them, or right before serving. The other school simply seasons their steaks with freshly ground black pepper before cooking and doesn't give it a second thought. Who's right? It's not that the notion of burning pepper is complete nonsense—in theory, yes, black pepper could burn. The problem with peppering midway through cooking is that the pepper granules might not stick to the meat. You could pass a pepper grinder at the table, but if you're cooking outside and eating in an informal style, this may not be feasible. So unless you've detected a burnt pepper flavor on your steaks in the past, by all means, season your steaks with freshly ground black pepper before cooking them.